For days before my recent trip to Italy, I saved locations to my collection of places on Google Maps. Now I can access them from my iPhone, too. I created a folder for each of my ancestral hometowns I planned to visit. I pinpointed churches, cemeteries, our hotels and a handful of addresses I'd found on my ancestors' vital records. For remote locations, I used the longitude and latitude coordinates. I planned to locate homes where my grandfathers and great grandparents were born or died. In case I didn't have Wi-Fi (I didn't) and was afraid of blowing through my data (I was), I also had a printout of a map. 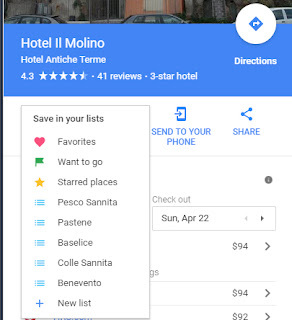 On the map are addresses and facts with arrows pointing to the locations. 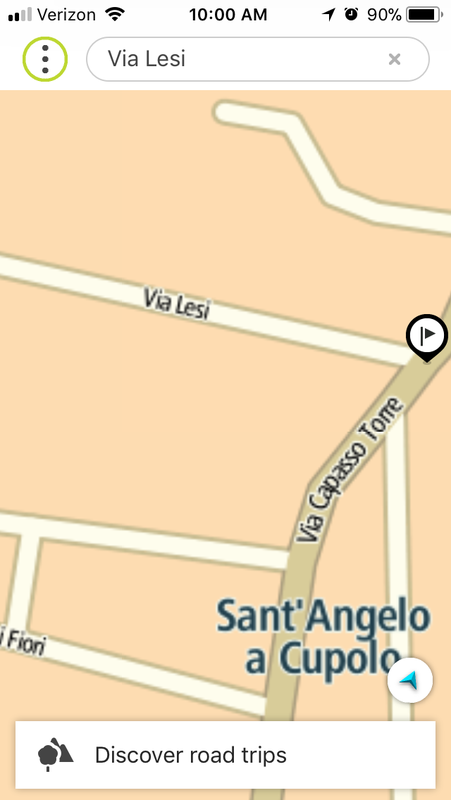 I used one map to ask some locals where a particular street was. They were so kind, one man began asking anyone nearby if they remembered a family named Iammucci. We all had a laugh when they learned my great grandmother died in 1929. Of course they didn't remember her name! The other map helped me walk around another town and find the places (mostly rubble) where members of my father's family were born. 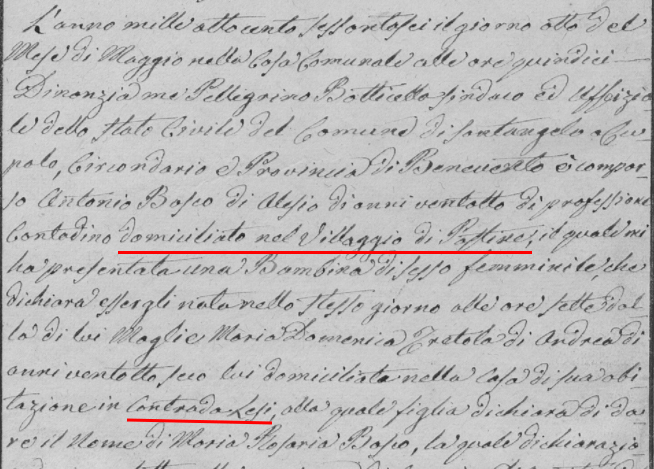 Some of the facts I'd learned from my ancestors' Italian birth records confused me. Why was my grandfather born at one address in town, and his sister born at another address in town, when his real house was not in the town? They knocked down his house, damaged by an earthquake, in 1964 or so. It stood on the land where some of my cousins live today, well outside of town. My cousin Maria explained it to me. Back in the day, my Iamarino family owned a little house in town—not much more than one room. They lived out in the countryside, but when my great grandmother was about to give birth, she'd go to the house in town. It took a mule and a cart to get to town, and town is where the midwife (levatrice) lived. So, to be near the midwife, my great grandmother would have waited at the house in town until she was ready to give birth. That explains a lot. That's how my countryside-living relatives could bring the newborn baby to the mayor's office without killing the baby! Walking where my ancestors were born and died. I will no longer add the address of a baby's birth as the residence of the parents in my family tree. It may very well not be their residence. When I visited my dad's first cousins on May 13, they pulled out a plot plan—the type you might see for new construction here in America. It showed the locations of many houses that are no longer standing. They surrounded the house where we were gathered. My great grandparents raised their four children in one house. 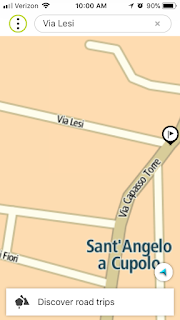 Straight across the street was the home of my great grandmother Libera's sister. It was also the home of my great grandfather Francesco's brother. 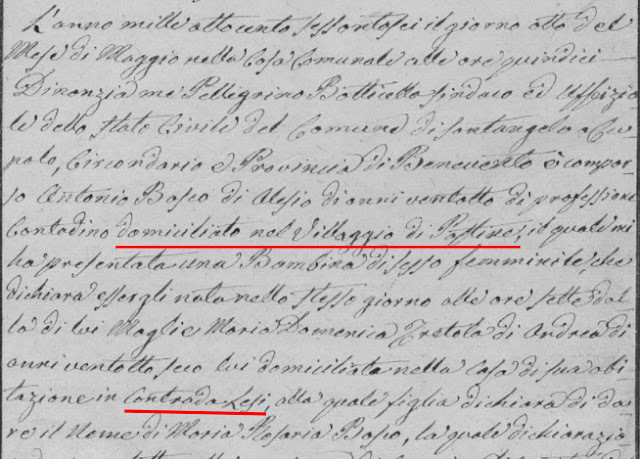 You see, Libera's sister had married Francesco's brother. 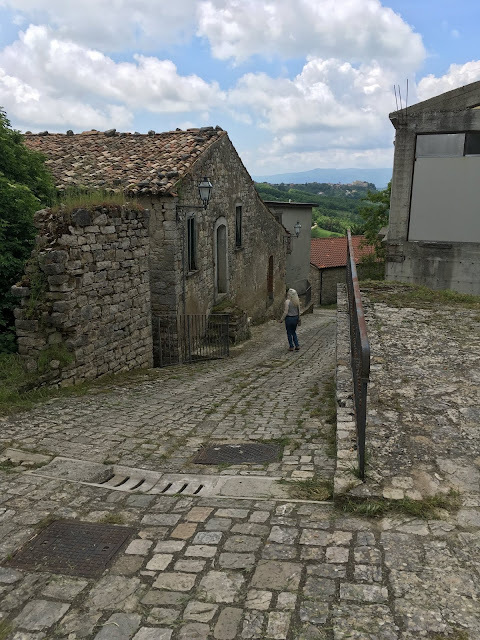 This cluster of houses was a contrada—a group of homes, often rural, given a nickname instead of a modern-day street address. I had thought a contrada was named for a particular family, but in my family's case, it was simply a nickname. Please keep this story in mind if your family documents show addresses that don't seem to make sense. 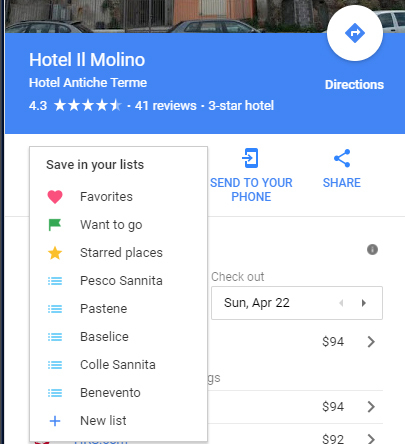 A few months ago I explained how you can add locations to Google Maps and save them in your own personal collection. I use these collections to plot my relatives' homes in Italy, the landmarks I can see from my mountaintop home, and the many places I've lived. 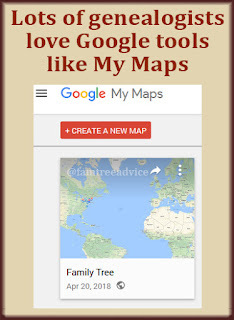 You can use Google My Maps for genealogy. 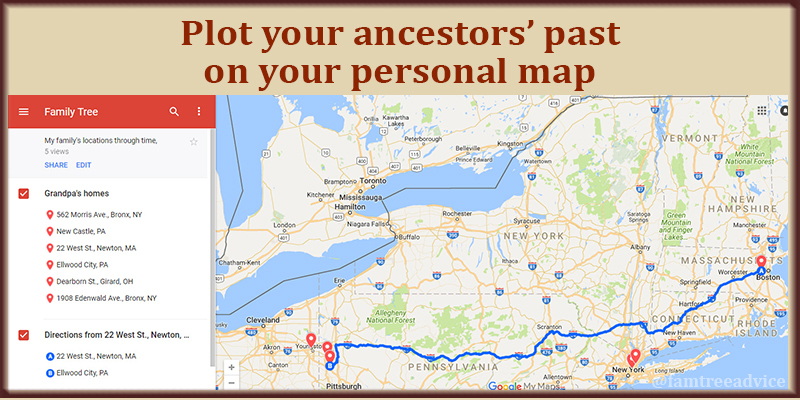 Google's mapping features can come in handy to family tree researchers like you. If you don't have a Google account, create one. It's free and gives you access to far too many tools to ignore. Once logged in, go to Google My Maps and click the red button to Create a New Map. 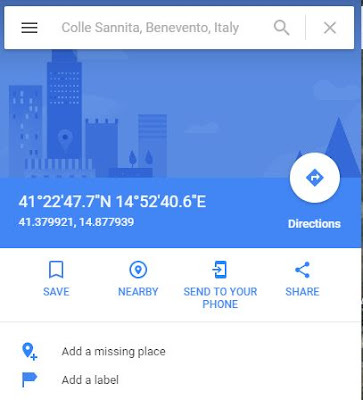 You can start adding addresses and adding a description to each map pin. 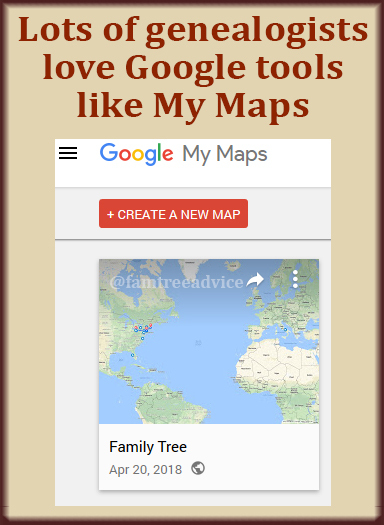 You can color-code your map pins, maybe choosing different pin colors for different branches of your family tree. Create different layers and you can separate the locations by family unit. That last feature could be a tremendous help for your family tree research. You can use your family tree software to create a report on all the addresses in your tree. Then copy those addresses into a spreadsheet. Finally, import the locations into your map. My original thought was to create a migration map for some of my ancestors. Google My Maps can do that. I've added my grandfather's addresses to a map. I've detailed each map pin with his name and the year(s) he lived there. This fully customizable, full-featured map highlights my grandfather's travels with the United States. Now I can use Google My Maps to draw lines showing his progression through time. In this image, instead of drawing a straight line, I used driving instructions. This makes a more realistic picture of Grandpa's path from his uncle's home in Newton, Massachusetts, to the coal mine in New Castle, Pennsylvania. I've only scratched the surface here. Let me get back to you soon with a detailed map that I hope will inspire you in your family tree research. UPDATE: I did a test of importing an Excel file of addresses into a map. You can import only 200 addresses at a time. Add a header row called Address. It worked well. See the "Import test" layer at https://drive.google.com/open?id=1m-wnmVFmpKYPjUISJ6VVq3XCWEE&usp=sharing. Now I can customize these new map pins as desired. I take the most exhausting vacations known to mankind. There's no sitting by the pool. There's no lying on the beach. There's tons of sightseeing and a painful amount of walking. But I love it that way. My major vacation for 2017 ended on Monday. 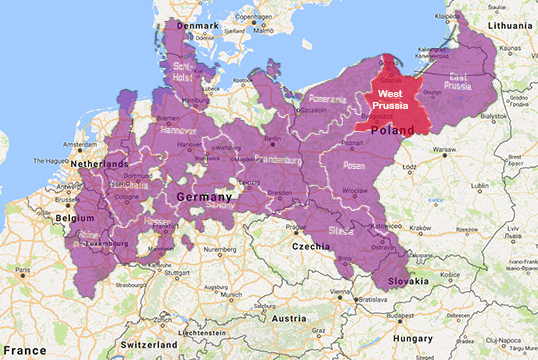 Now I want to map out some shorter-distance, shorter-length genealogy vacations for this summer. And you should, too. Last summer my husband and I planned a trip to the Finger Lakes of New York, knowing that my grandmother was born in Hornellsville, 45 minutes west of Cornell. So we booked a hotel in Cornell and made our sightseeing, winery-touring plans. On the way west, we drove past Cornell and went straight to the house where my grandmother lived as a little girl. It's most likely where she and her brother were born. We visited the local library searching for evidence of my great grandfather. And we walked along the railroad tracks by the station where he worked. Here's what I learned from that side-trip: Plan better! Using my family tree software, I can find nearby places I should visit. We discovered that my great grandfather's railroad station is now a museum, but it wasn't open that day. We drove past the church where one of my great grandmother Caruso's brothers got married, but I didn't think to go in. My great grandparents were probably married there, too. 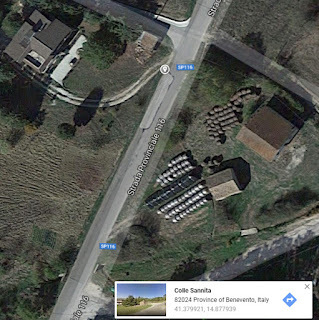 I later discovered on FindAGrave.com that many of my Caruso relatives are buried in that churchyard. Oh, the horror! I have to go back and spend a couple of days there sometime. My grandmother's house was almost a five-hour drive away. What can I do that's much closer—that I may be able to do in one long day or short weekend? Think about your family tree. Which of your ancestors lived or spent any time in a place that's not too far from where you are now? In Family Tree Maker, I can drill down from the USA to New York state, to nearby counties. I see lots of houses and cemeteries I want to visit. Let's get out our calendars. It's genealogy vacation time! 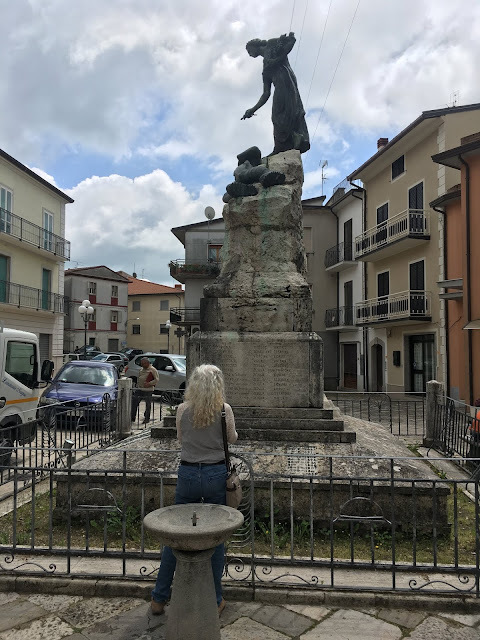 When I think of my first ancestor coming from a small rural town in Italy to the metropolis of New York City in 1890, I picture him being overwhelmed by the congestion and fast pace. But maybe it wasn't that hectic. New York City was dramatically different 127 years ago. Take a tour through the online photo collection of the Library of Congress for more images. You can narrow your search by choosing a time period and a location. The library's collection of historic American buildings can give you a glimpse of the landmarks your ancestors saw in their day. If your ancestors were here for generations before mine, you might like the Library of Congress' various map collections. Drill down through the Cities and Towns collection, then narrow the results by date and location. It may be difficult to imagine any U.S. city being underdeveloped. These digital collections can help you get in touch with the United States of your ancestors. Have you ever seen a Google car driving around? I saw one, and it was goofy as can be. I'm grateful for those cars! They've driven up and down the windy, narrow streets of my ancestral hometowns in Italy. My ancestors, and maybe yours, left their homeland because of poverty and a lack of prospects. But today their sleepy little hill towns beckon to me with their beauty and serenity. 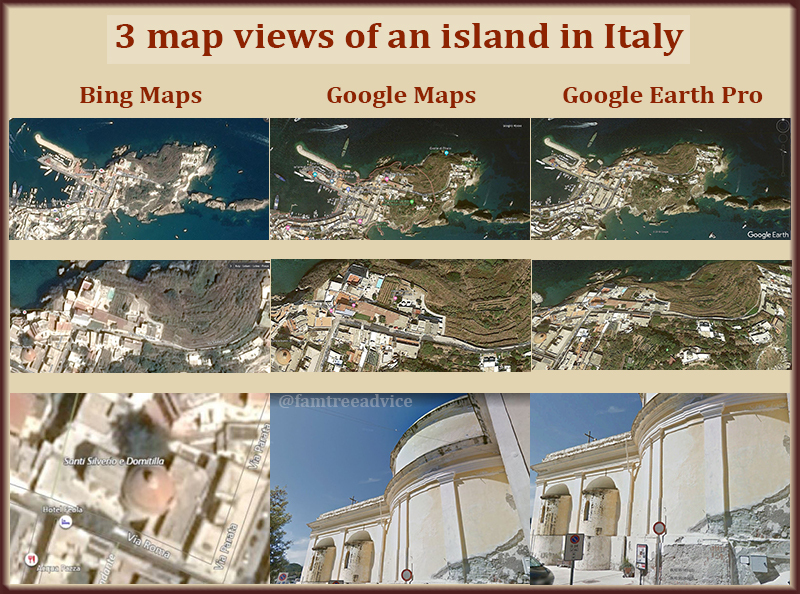 I use a combination of Bing maps and Google maps. In Bing I save collections of places. I have one collection of all the landmarks I can see from my mountaintop home in New York. 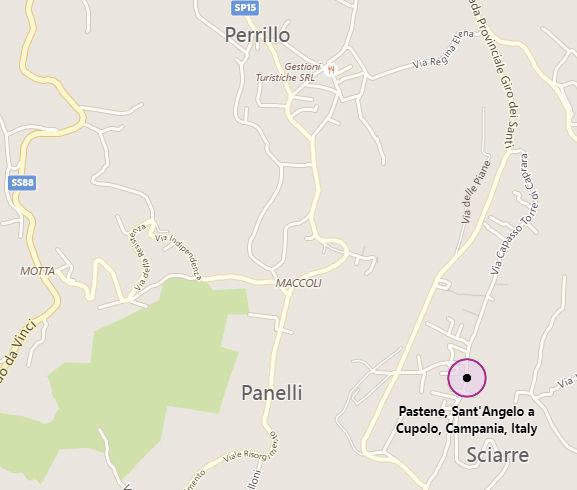 In another collection, I have some of the current and past homes of my relatives in Italy. 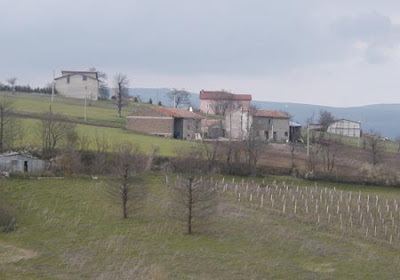 The view from my grandfather Leone's first home in Basélice. Bing offers a birdseye view, and sometimes a street-level view. But Google has sent that crazy car exactly where I want be, like the house where my grandfather was born in 1891. I can sit here at my desk and "stand" in Italy. 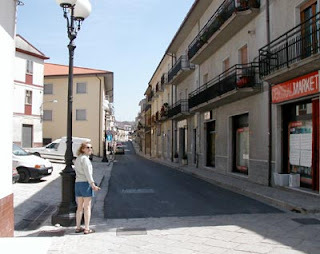 I'm right outside the rebuilt house in Basélice, Italy, of my grandfather Adamo Leone. I can see the amazing hilltop views I'll bet his family loved. 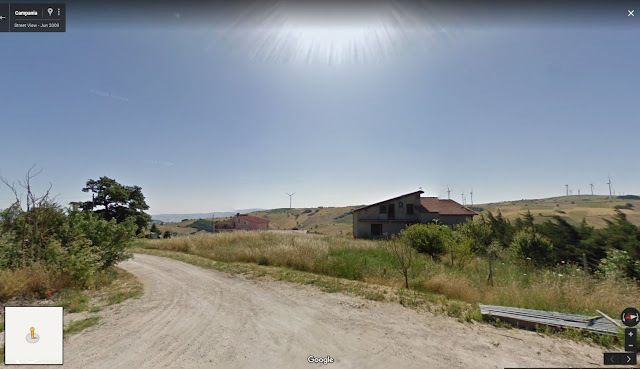 I can "stand" near my cousin Esterina's pink house in Colle Sannita, Italy, and see the giant windmills that lead to Basélice. On Esterina's property, partially buried in the ground, is an old doorstep. That's where my other grandfather Pietro Iamarino's house once stood. The view from my grandfather Iamarino's one-time land in Colle Sannita. If you're lucky enough to have a birth record for your ancestor, check it again for a street name, and maybe a house number. Then give it a shot—put that address into Google maps and see if you can walk the streets where your roots still live. My parents grew up in a tight-knit neighborhood in the Bronx, New York. They went to grade school together, and it was a very small class of neighborhood kids. They had relatives nearby, either in their apartment buildings or on their blocks. Family gatherings were held at the house where my mother was born until the time when our relatives no longer lived there or owned it. I have childhood memories of the neighborhood, but they're a bit vague now, and my mom's building was eventually torn down. 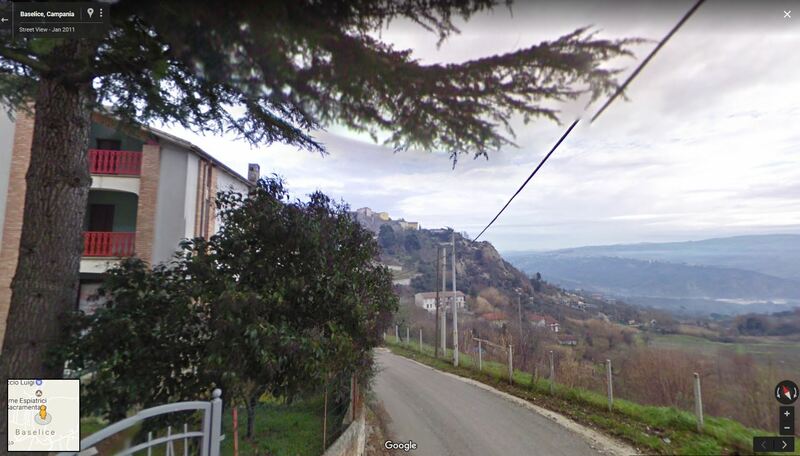 That's why I like to use "Street View" on either Google or Bing maps and feel like I'm driving through the neighborhood. I can use it to go right up to the door of the church where I was baptized, which is a couple of doors up from where my mom was born. 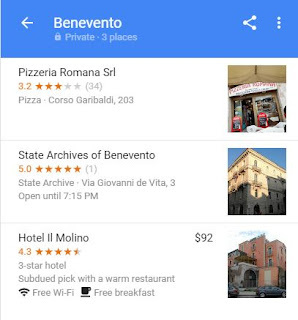 But you can do more with Bing and Google maps, like creating collections of addresses and plotting them on the map. Based on all of my collected information—census forms, draft registration cards, city directories, death certificates—I plotted a handful of my closest relatives' addresses in the Bronx from 1900 to 1940. There were some outlying locations over the years (meaning a few blocks away), but the various families tended to cluster together again and again. 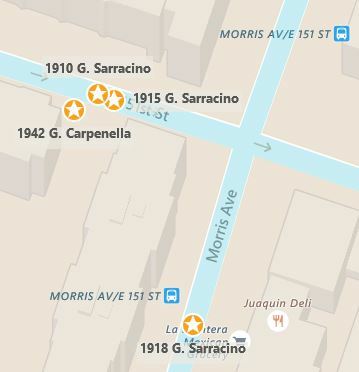 Plotting my great grandfather Giovanni Sarracino's handful of Bronx addresses finally helped me make sense of his on again/off again relationship with beer companies. He and my great grandmother Maria Rosa came to America in July 1899 to join Maria Rosa's father Antonio (my first ancestor to come to America) in the Bronx. 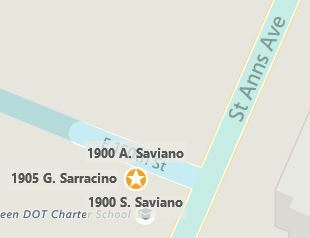 In 1900 and 1905, Giovanni and Maria Rosa did not live in the neighborhood where my parents later grew up. They were quite a few blocks away by St. Ann's Avenue. That St. Ann's address is associated with Ebling's Brewery. Ebling was a famous brewery operating in the Bronx in those days, and William H. Ebling, Jr., was the vice-president of the Westchester Brewing Company in Mount Vernon, which borders the Bronx. Going back to my collected documents, my great grandfather was a bartender in 1905, worked in a saloon in 1910, but after that he was a painter in buildings. Now I know that he lived right by Ebling Brewery in the earlier years. He may have formed a business relationship with Ebling, because newspaper clippings I discovered showed that he sold a building to the Westchester County Brewing Company of Mount Vernon, New York for $2,500 in late 1912. 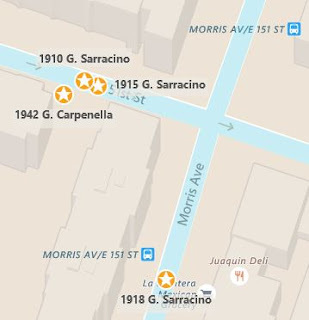 In 1921 he either bought or sold his former residence of 603 Morris Avenue (the abbreviations in the clipping make it difficult to understand), and he is listed in the transaction as "Ebling Brewing Co., agt [agent] Giovanni Sarracino et al." Was my great grandfather flipping houses back in the day? Or was he buying or selling the building on behalf of Ebling for a piece of the sale? In 2009 at a St. Ann's Avenue construction site, tunnels were unearthed and discovered to be the "Natural Caves" where Ebling aged their beer a century before, and they stretched quite a long distance. Until I can find out more, I'd like to think Giovanni was selling the earth beneath his building for $3,000 in 1921 to age that crisp Bronx-water beer.